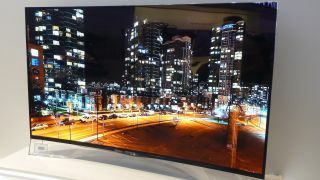 LG has halved the asking price for its startling 55-inch curved OLED television set, a little over six months after it first went on sale. In the United States the 55EA9800 set has been reduced to 'just' $7,999 (plus a $1,000 instant rebate), down from the initial $14,999 price point. On the other side of the Atlantic, Brits are able pick up the television for £4,999, compared with the original £7,999 on-sale price. However, rather than the price cut being aimed at shifting inventory before the focus switches completely to 4K sets, LG claims the half price sale is about making the razor-thin OLED tellies more affordable, thus aiding their proliferation. In a statement, William Cho, president of LG Electronics in the United States wrote: "Our goal is to grow the US OLED TV market by making OLED TVs more affordable. And this is another step in that direction." The 55EA9800 will remain in the company's line-up until at least the middle of next-year, LG claimed, but is it worth your money, even at this dramatically reduced price? In our hands-on review, we described the curved display as a "pure and pointless novelty," despite the incredible image quality, and called for the arrival of flexible graphite panels, allowing it to be "bent back into shape in no time." There's 4K TV at the Winter Olympics, but you can't watch it.